I absolutely adore this idea. 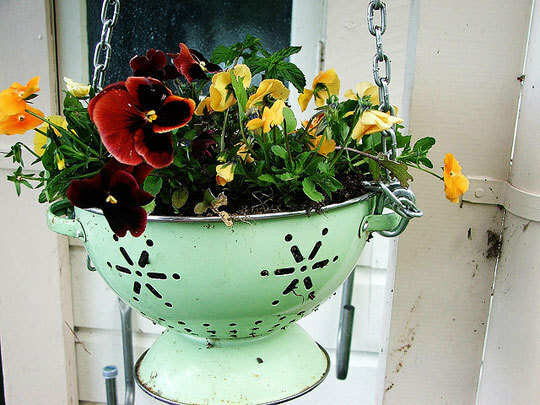 I am always running across vintage, metal strainers at antique shops in a variety of colors. I don’t want to actually use them in the kitchen because it makes me nervous to put food in a container that has been sitting in a dusty store for who know how long; however, this is a perfect solution! Get ready for spring and planting flowers. Too funny! I have this photo & a couple of the others sitting in a post for later this week. 🙂 So, I like your taste! I know what you mean about not wanting to use these for food but still liking them. Those pretty colors! *sigh* The vintage-lover’s dilemma. Cute idea! I may have to steal this idea during the summer time.